Function: Function: The Sentencing and Corrections Oversight Commission is tasked with monitoring and assisting the implementation of HB 1525, The Justice Reinvestment Act (JIA), and evaluating recidivism reductions, cost savings, and other effects resulting from the implementation. The commission shall determine ways to reinvest any cost savings to pay for the continued implementation of the JIA and other evidence-based practices for reducing recidivism. The Commission shall also examine the issue of restitution for crime victims, including the amount ordered and collected annually, methods and costs of collection, and restitution's order of priority in official procedures and documents. 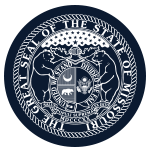 Member Requirements: Three members to be appointed by the Governor, one of whom shall be a victim's advocate, one of whom shall be a representative from the Missouri Sheriffs' Association, and one of whom shall be a representative of the Missouri Association of Counties.